Marketing your salon online is not an easy job. Sometimes it feels like there aren’t enough hours in the day to keep on top of Instagram, Facebook, Messenger, reviews, and everything else. Fortunately there are a ton of amazing websites and apps you can use that will make marketing a breeze. I personally use all of these apps for my business and I LOVE them. From graphic design to planning out your Instagram feed, I hope that you’ll be able to make use of them too! Later is an app for Desktop, iOS and Android that lets you do two awesome things. First of all, you can schedule and auto-post your Instagram photos from a computer so you don’t need to be constantly on your phone editing captions and posting. But even cooler, Later lets you visually plan out your feed in advance so you can make a gorgeous theme with photos that look best together. You can move around your photos for the coming days/weeks/months so they blend well and create a fantastic looking feed. The first clear advantage of Later is that it helps you save time in promoting your salon on Instagram. Instead of daily posting, you can batch your posts in one day and have them ready for the next month. But the main reason why I love Later is that it helps you to create a visual theme. By looking at all of your photos together, you can move them around until they fit together perfectly. It might seem like a small detail, but creating a beautiful, cohesive and branded Instagram feed is one of the best things you can do to gain Instagram followers. You can read more about how to create an Instagram theme for your salon here. When I found out about the Landscape app, it was a bittersweet moment. I was excited to find a site that would make my life easier, but slightly upset that I didn’t discover it sooner! Landscape is a super easy to use site. All you have to do is upload your photos, choose which social network you want to re-size them for, and you can download all the right-sized photos in one go! Whether it’s a perfectly-sized Facebook cover photo, a profile photo for Instagram, or a blog graphic, Landscape will turn them out for you. Great images are one of the cornerstones of marketing; they make everything look better and more professional. And having the correct-sized images where nothing is cropped out makes your salon brand look professional online. Not to mention you’ll be saving a ton of time by not needing to research the right social media image sizes and crop them manually! Snapseed is a mobile app for editing your social media photos and adding custom filters - far superior to the standard Instagram filters! Instagram filters are often snubbed in the beauty industry because they’re so strong and can completely change the look of your work. Hair photos might come out a different colour or look fake, and the same goes for nail colors. Snapseed on the other hand gives you almost unlimited options for slightly editing your photos while adding a subtle filter. Adding a consistent photo style and filter colour can make your Instagram feed look beautiful and consistent! Photo editing doesn’t have to be dramatic with heavy filters. But it can take your photos from “okay” to great. And on Instagram, sharing beautiful photos of your work can go SUCH a long way in promoting your brand and gaining new clients. Quik is an easy to use video editing app for Android and iPhone. You can use it to stitch together short clips, add music and text, and get a really professional look! Videos are taking over social media! While Instagram still does better as a photo medium (except for Instagram stories and IGTV), videos on Facebook tend to get better reach and engagement. If you can create quick fun videos to promote your salon, you will get so many more people interested in your business. Try out Quik and you’ll see just how easy it is! Canva is a mobile plus desktop app for creating graphics of any sort - social media posts, website images, flyers and more. Not only do they have a ton of templates, it’s also easy to save your own brand identity and apply your unique colours and fonts to everything you make. On social media, graphics are important but should not be overused. Also, when you do use them, you want to make sure that they’re branded. The last thing you want is a messy Instagram feed that is full of mismatched graphics. But sometimes you do need to promote salon specials, and you do want to share that motivational quote. What do you do? Use Canva to create a set of branded graphics to use on Instagram that have your colors and fonts. Use can do the same thing with Canva! First, make sure you have a branding board with clearly defined color palette and font palette (read my blog post about how to make a branding board with Canva here). Next, create a few graphic templates in Canva. You can try out a motivational quote, a promotion, a client before/after and a product spotlight photo. Try to make them match your brand style and of course they should have your colors and fonts too. If you’re feeling stuck, try making a simple one like Blushtan with your main colour as the background, some basic text (with your font) and your logo at the bottom. Interact is a website where you can create your own quizzes that are fun for your clients but also help to promote your services. For example, if you do lash extensions, your quiz could be “What’s your ideal lash type?”. Or if you do hair colouring, you could make a quiz called “Find your hair colour soulmate with this personality quiz”. Do you sometimes feel lost about what to share on Facebook? Or when you do post something, you barely get any likes or comments? Quizzes are a fun way to get people interested in your services and to interact with your salon on social media. Your quiz should be easy and entertaining, but it should also incorporate your services and encourage people to book an appointment. So if for example your quiz result tells people their “Perfect nail shape”, afterwards you can include a button to get them to book an appointment. They’re already engaged with your business, so they’re much more likely to take action! Salon marketing can be a tough job, especially because you’re probably squeezed for time with admin, out on the salon floor, and everything else that comes with having a business. If you want to make a bigger impact with your marketing but spend less time at the computer, some of these apps can be a huge help. They can help you find more clients, keep up with social media, and brand your salon. 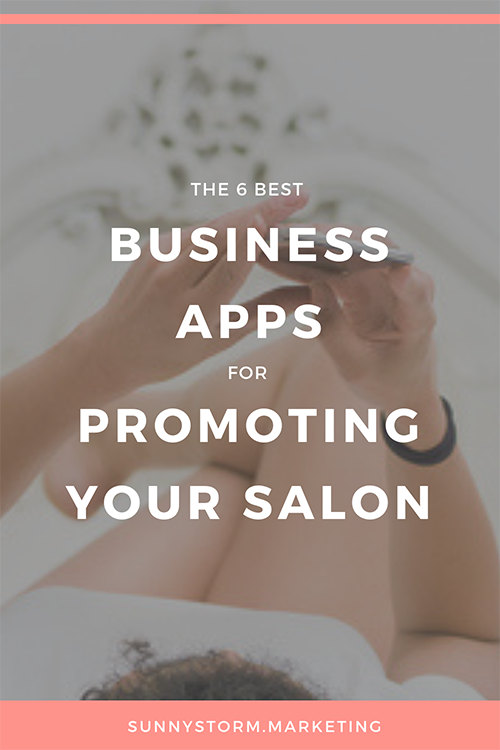 Try some of these apps out and you’ll find that promoting your salon online gets a whole lot easier! And one last thing... if you're looking for new ways to market your business, have you thought about starting with a beautiful brand? I wrote a 67-page eBook (packed with info!) all about building a beautiful visual brand for your salon. From logos to colors to everything in between, it's in here. Download The "Ultimate Guide To Building a Beautiful Salon Brand" below!